It began innocently enough; the Fox family moved to Lowell, Arkansas in 1983 in search of a better job and a better future. Shortly after their arrival, the family moved into an old Victorian home located next to the plant where both parents worked. The house was like a dream come true, big enough to accommodate the large family and filled with old charm and character. The dream quickly turned to a nightmare, one that left the family searching for answers.Within a week of moving in, unexplained events begin to happen. Unaware of the sinister past of the house, the Fox family lives through a series of unexplained and chilling events that leave them wondering if they are losing their sanity, or if there is something more evil at work. 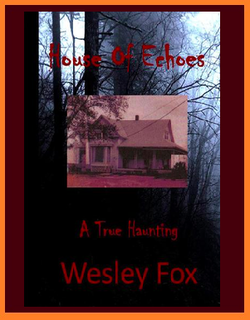 House of Echoes: A True Haunting follows Jesse and Carol Fox and their children through the chilling nightmare that left them searching for answers. House of Echoes is more than the average ghost story; it weaves together the survival of a resilient family with the simple lesson that love can triumph over evil. Wesley Fox lives in Branson, Missouri. Wesley is the Director of the Branson Paranormal Chasers and a tour guide with Branson Ghost&Legends. His paranormal group sets out to find the truth and offer help to the families in need, like this family needed 30 years ago.